Sarah Brooks is Professor of Political Science at Ohio State University (Ph.D., Duke University). She joined OSU in 2001, and is a faculty fellow at the Mershon Center for International Security Studies. Her research and teaching interests center on international political economy, comparative politics of developing countries, and the political economy of risk protection. Brooks is Associate Editor of the American Journal of Political Science (2018-19), as well as a Huber Faculty Fellow. She is on the Steering Committee of the International Political Economy Society and co-director of the Globalization Workshop at the Mershon Center. 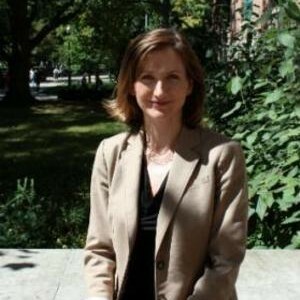 She is a member of the editorial board of International Studies Quarterly, Socio-Economic Review, and Regions and Cohesion.As a scholar of comparative and international political economy, Brooks' research interests revolve around the relationship between the state and market in social and economic relations. In the field of international political economy, her research examines the political economy of sovereign risk and global capital flows. Her research in comparative politics examines the political effects of risk and insecurity in Brazil and South Africa. Her first book, Social Protection and the Market in Latin America: The Transformation of Social Security Institutions was published by Cambridge University Press in 2009. Brooks also has published articles in an array of scholarly journals, including International Organization, American Journal of Political Science, The Journal of Politics, World Politics, Comparative Political Studies, International Studies Quarterly, Politics and Society, and Latin American Politics and Society. Her recent projects include an analysis of the "resource curse," which challenges conventional views of the political and economic effects of natural resource wealth, and a study of sovereign risk in emerging markets. In addition, Brooks is engaged in a multi-year survey of the effects of economic risk and violence on political behavior in Brazil and South Africa. Her research has been funded by the Gerda Henkel Stiftung and she was a Fulbright Scholar in South Africa. My research is situated at the intersection of comparative and international political economy. Since my appointment at Ohio State University in 2001, my research and has developed around four broad research agendas in the political economy of development. The first, largely complete at the time of promotion to Associate Professor, examined the politics of institutional change as it occurs in the shift from state to market-based pension systems. This project culminated in a book that is was published with Cambridge University Press (Social Protection and the Market in Latin America 2009), as well as two peer-reviewed articles (Comparative Political Studies 2002, Latin American Politics and Society 2007) and two chapters in edited volumes (New Ideas in Old Age Security 2001, Pension Reform: Issues and Prospects 2006). My second major research project, which is ongoing, investigates the links between global forces and domestic politics, particularly in the areas of policy interdependence and the political economy of economic liberalization. This project has yielded seven peer-reviewed articles (World Politics 2004, International Studies Quarterly 2005, American Journal of Political Science 2007, Journal of Politics 2007, World Politics 2008, International Organization 2012, and Politics & Society 2015) along with one chapter in an edited volume (Learning from Foreign Models 2004). A third project, which has developed fully since my promotion to Associate Professor, and is ongoing, examines the political economy of natural resource development, seeking in particular to challenge and more carefully specify the so-called ‘resource curse’ in oil-rich countries. This study has resulted so far in two peer-reviewed articles (Comparative Political Studies 2011, International Organization 2016) and one chapter in an edited volume (New Order and Progress in Brazil, 2016). Finally, my fourth research project, which is also ongoing, examines the role of risk from both the perspective of domestic and international political economy. The comparative dimension of this project examines how access to economic and physical risk protection shapes citizen engagement in domestic politics and has produced one peer-reviewed journal article (Journal of Politics 2014) and two original surveys in Brazil and South Africa. The international political economy dimension of the project explores the foundations of sovereign risk assessments in international capital markets (International Studies Quarterly 2014). I have carried out field research for both the domestic and international aspects of this project and have two associated working papers that will enter into the review process in 2016. Moving forward, my research focus will rest primarily on the risk project, as I have ongoing collaborations with colleagues that promise to generate a series of future articles in each vein of the project. At the same time, my ongoing study of the political ‘resource curse’ will remain an important side project in my broader research program. All four research projects are discussed below. Project I: Institutional Change from State to Market My first research project examined the politics of institutional change through analysis of social security reforms across nations. Starting in the last quarter of the twentieth century, public pension systems around the world have undergone varying degrees of “privatization,” which transfers some degree of the cost and risk of old age income provision from society as a whole, which is the sponsor of state social insurance systems, to individuals, who must then save for their own retirement in privately-managed pension accounts. The first article in this project (Comparative Political Studies 2002) provided a quantitative analysis of the likelihood and degree to which governments privatize state pension systems around the world. To estimate the latter, I simulated the public-private ‘mix’ in the average wage-earner’s pension under reformed pension institutions, and explained cross-national variations in this outcome as a function of domestic and international political, economic and institutional variables. A similar methodology was used to examine the economic and political foundations of structural pension reform in a chapter for an edited volume (New Ideas about Old Age Security 2001, co-authored with Estelle James). Subsequent research in this vein examined the politics of a specific type of pension reform that individualizes old age costs and risks without privatizing (Pension Reform: Issues and Prospects 2006, co-authored with Kent Weaver) and the international economic influences on pension reform in Argentina and Brazil (Latin American Politics and Society 2007). The centerpiece of this project was my book, Social Protection and the Market: The Transformation of Social Security Institutions in Latin America, which was published by Cambridge University Press (November 2008, with a 2009 copyright). The book addresses a central issue in comparative political economy and in the study of institutions more generally: When do institutions, particularly those like pensions that are subject to strong self-reinforcing dynamics, become subject to fundamental, “path-departing” structural change? The book provides a politically-grounded theoretical and empirical account of institutional change by explaining when and how governments privatize social security systems and why some nations enact more radical reforms than others. Among privatizing countries, the empirical model explains variations in the degree of institutional change from public (risk-pooling) to private (individual savings) pension systems. Although the analysis focuses principally on the developing world, I use global data to establish the generalizability of the argument. The statistical analysis reveals important contingencies in the politics of pension reform that challenge several pillars of the conventional wisdom on this reform. I find that neither institutional ‘policy feedback’ mechanisms nor legislative institutions have a direct or linear effect on institutional change. Rather, the former is conditioned on the generosity of the pension system while the latter depends on the partisan structure of political conflict. The analysis also challenges key assumptions in the international political economy literature by showing that the most capital-scarce and open economies are not more likely to enact market-oriented structural reform under the weight of global economic pressure. Crucially, globalization may constrain movements toward pension privatization in capital-importing nations. I show that this double-bind of globalization for developing countries can be observed not only in the liberalizing reforms that governments implement, but also in the policy actions that governments forbear from undertaking, in an effort to avoid market punishment. The book develops a theory of path-departing institutional change along three analytical dimensions. I argue that political conflicts give way to deep and enduring institutional change where 1) governments possess the financial leeway to escape the risk of market punishment, 2) reformers can sever the material bases for consent to the existing social bargain, and 3) government leaders can credibly organize legislative conflict around privatization’s creative, or distributive, elements. In the first instance, I argue that international financial markets generate often-contradictory rewards and punishments for governments to embrace old-age pension reform. Finding themselves more in a double bind than a ‘race to the bottom,’ the most cash-strapped governments may opt to curtail or forego pension privatization efforts in order to avoid market punishment. The next part of my argument examines how the political legacies of old age pension systems that may long uphold an institution, but later permit, or even promote path-departing institutional change. In political conflicts over pension reform, reformers may use new information about the institution or ideological rhetoric to sever public attachments to what had long been stable and self-reinforcing social welfare institutions. The efficacy of these strategies, however, depends heavily on the institution’s political legacy and the partisan credibility of the reforming government. Finally, I examine the legislative arena, where majority support for loss-imposing reform must be won in democratic assemblies. Here I argue that the multidimensional nature of pension system restructuring – which has creative as well as loss-imposing elements – means that legislative conflicts may not unfold strictly around either a ‘veto’ or ‘credit-claiming’ logic, as previous studies have argued. Rather, the outcome of legislative battles depends on the relative salience of these dimensions, and thus on the partisan structure of the political conflict and efforts to increase the distributive perception of the reform. I bring evidence to these expectations in part three of the book, which employs structured qualitative comparisons of pension reform conflicts in four Latin American countries (Argentina, Brazil, Mexico and Uruguay). The comparative analysis draws upon field research carried out in Latin America and at the World Bank between 1998 and 2003, including interviews with politicians, technocrats and other participants in the pension reform processes in the four countries. In addition to testing my expectations about the causal mechanisms of institutional change, I draw out preliminary hypotheses about when institutions restructuring efforts are likely to endure, and when they are likely to revert to the long-established institutional ‘path’ of state-dominated social insurance provision. Project II [2004 to Present]: Global Forces in Domestic Politics My second major research project challenges conventional views of the monolithic or homogenizing effects of economic globalization on domestic political decisions. In the first paper of this project (World Politics 2004) I test the double-bind hypothesis that financial globalization generates not only strong incentives for governments to enact market-oriented reform, but also powerful threats of punishment that impede those reforms where such measures entail heavy short-term financial costs. Analysis of two decades of capital account liberalization in Latin America and the OECD confirms this hypothesis, revealing that financial weakness and capital scarcity are associated with less movement toward capital account opening in Latin America, but with greater liberalization in the rich nations. Despite having the most to gain from international financial liberalization, I argue, developing nations with weaker domestic financial sectors face higher risks of transitional dislocations following liberalization and thus move less vigorously toward openness.Other papers in this project question the assumption of independence in market-oriented policy reforms by modeling the interdependent sources of policy change. In the next article in this vein (International Studies Quarterly 2005) I use a duration analysis to test the hypothesis that decisions to adopt market-oriented pension reform in one country are systematically linked to similar decisions in ‘peer’ nations. The paper develops a theoretical argument based upon bounded rationality, while arguing for a ‘soft power’ approach to understanding the role of international financial institutions in the diffusion of policy paradigms. I find significant evidence that the diffusion of policy innovations has occurred through peer networks, which vary in their force across regions. In my next paper in this project (Journal of Politics 2007), I probe the mechanisms of policy diffusion more deeply, asking not just whether diffusion matters, but also when and why it might shape domestic policy change. Using a competing risks framework, I show that cross-national diffusion forces vary in significance with the nature of the policy innovation –specifically, with the irreversible, or ‘sunk’ political and economic costs of enactment – and according to the characteristics of the adopting country itself. The bivariate probit model shows peer effects at work in the adoption of costly and visible private pension reform models, but not in the more opaque and reversible ‘notional’ pension reform innovations. Also in this project, I developed a comparative analysis of the role of international policy models in domestic reform decisions to explain the nature and limits of transnational actors in the diffusion of private pension reforms in Latin America (Learning from Foreign Models 2004.) Other papers in this research project challenge conventional views relating to the politics of economic liberalization in Latin America. The first paper in this vein (American Journal of Political Science 2007, with Marcus Kurtz,) explains differences in patterns of economic reform across trade and capital account policies as a function of the information environment, the timing of reform costs and the distributional impact of different policy measures. The cross-sectional time series analysis reveals that economic contexts, partisanship, and institutional dynamics mediate both the timing and the salience of reform costs, and thus the movement toward market-oriented reform across policy areas. A subsequent paper in this research project (World Politics 2008, with Marcus Kurtz) asks whether governments in Latin America may be pursuing multiple paths to international economic integration, in some cases ‘embedding’ economic openness in a broader public sector effort. The analysis finds that while several Latin American countries have moved toward an orthodox neoliberal model with minimal state interventions as many scholars have expected, other governments have maintained a broader public sector presence through supply side interventions while simultaneously pursuing deep macroeconomic liberalization. Consistent with the broader theme of this research project, that article highlights ways in which globalization has not been a strictly unidirectional force that would prompt a ‘race to the bottom’ dynamic; rather, we find evidence to support the argument that economic openness is quite consistent with certain new forms of state intervention. A final paper in this project examines the politics of capital account liberalization from the perspective of historical legacies of state-led industrialization (International Organization, 2012, with Marcus Kurtz). In this article, we demonstrate that industrialization creates structural changes in the economy that alter the domestic political coalitions around financial globalization, while also delimiting a sub-regional set of peer countries to which government actors look when deciding whether to liberalize capital controls. In this way, we show how the legacies of statist economic development programs affect the contemporary regulation of international financial flows, while at the same time shaping the process of international policy diffusion across developing countries. Project III. Rethinking the Resource Curse My third and fourth projects developed after my promotion to Associate Professor. The third project grew out of a 2009 conference sponsored by the International Studies Association, which sought to bring together scholars who are not experts in natural resource politics, but who could bring to bear IPE perspectives from other substantive areas to examine natural resource governance. In the first paper in this project (Comparative Political Studies 2011, with Marcus Kurtz), we argue that whether oil has a positive or negative impact on the domestic economy depends critically on the human capital stocks in the country. Here the idea is that whether natural resource extraction contributes favorably to economic development, such as it did in many now-advanced industrial nations, depends upon the technology and domestic human capital that is mobilized in that process. Our second paper in this project examines the political consequences of natural resource abundance (International Organization, 2016). Our principal argument is that oil is endogenous to factors such as a country’s industrial development that also affect democratization. Controlling for endogenous natural resource wealth, and for diffusion effects on democracy, we find that oil abundance is positively related to democracy. The findings of that paper led directly into the third paper in this project, which seeks to address a tendency in the resource curse literature to consider all oil endowments to be a source of ‘easy money.’ But, we observe, the cost, technological complexity of extraction and production, for example, of more hard-to-get oil, such as the Canadian tar sands or Brazil’s ultra-deep-water reserves, are enormously different from, for example, Saudi or Kuwaiti on-shore fields. Building upon this observation, our current research seeks answer the question of whether ‘hard to get’ oil may not necessarily be a “curse” for political development, and whether instead it may be only the ‘easy to get’ oil that is detrimental to democratic development. We have gathered a geo-located dataset of global oil fields (proven and potential) that scores them along a series of dimensions relevant to assessment of the political resource curse, including the quality of the oil, how easily can it be extracted, and the international pricing structures for this particular kind of crude oil. By organizing our data by oil field rather than by country, we are able to examine the political or economic consequences of oil production when the same field spans more than one country. In our first working paper analyzing these data, we differentiate types of oil by the technology required for extraction and find that a political ‘resource curse’ may be observed among countries with technologically more simple to extract oil, while for the cases in which oil production derives from harder to get oil, there is no evidence of a political resource curse – indeed, there is even a positive effect of such harder-to-get oil on political development. We argue that the causal mechanism for this relationship rests in the industrialization process, and the associated processes of education and urbanization, which promote both stronger structural foundations for democratic development, and greater capacity to find and exploit hard-to-get oil. Project IV. Risk in Politics The fourth project in my research program examines how risk – and efforts to cope with risk at the domestic and international levels – shapes national politics. The project has developed along two parallel tracks. In the domestic political economy, I examine the causes and consequences of the distinct ways in which societies indemnify or reapportion an array of risks in society. These risks may include that of income loss due to unemployment or threats to personal security from crime or violence. At the international level, this project disentangles the ways in which investors perceive and measure political risk in financial markets, and the implications of those risk assessments for government policy autonomy in capital-importing nations. My study of the domestic politics of risk redistribution examines how institutions that mitigate or reapportion risk vary across societies. Individuals may be said to possess a ‘portfolio’ of risk-hedging mechanisms that allow them to cope with an array of risks, from threats to personal security and property, to loss of income. Whereas some risks are hedged through societal mechanisms such as families, trade groups, or mutual aid associations, others are indemnified by the state (through education, trade protections, domestic police or military organizations). Access to risk-pooling institutions has been shown to have powerful implications for economic and social behavior. However, much less is known about the political consequences of different risk-pooling systems, or the political foundations of their design and shift. In 2009 and 2011, I implemented two novel surveys of risk, insecurity and political behavior in Brazil. The first was a national-level phone survey with 2,000 respondents, while the second focused on geographically-referenced household survey of 1,500 respondents in two cities in Brazil: São Paulo and Recife. The results of this research were published as a solo-authored article in the Journal of Politics, 2014. In that article, I demonstrate that the more secure voters – who are not always the richest – are more likely to participate actively in democratic politics. By contrast to the American trends in political engagement, moreover, I find that the relationship between income and political participation is not linear, but takes the shape of a J-curve, wherein the poorest citizens – who qualify for Brazil’s Bolsa Família grant, are more actively engaged, but citizens just above the means-tested threshold for this anti-poverty grant are more likely to withdraw from democratic participation. And it is only in the middle and upper incomes that one may observe a rise in citizen engagement in local politics at higher incomes. In order to probe the generalizability of this finding, I developed and implemented a more in-depth, survey of the dynamics of risk protection and political behavior in South Africa. That household survey of 1,500 citizens in Johannesburg and Cape Town, also examined themes relating to attitudes toward redistribution, violence, rule of law, and democracy. The survey revealed, inter alia, that the results in Brazil were not unique: Again, the relationship between socioeconomic status and political engagement takes the shape of a J-curve in South Africa, whereas the relationship between security and active political engagement also is positive and linear. The research was funded with a grant from the Gerda Henkel Stiftung in 2013, and drew upon thirteen months of field research in South Africa during 2014 and 2015, including seven months as a Fulbright Scholar at the University of Johannesburg. The working paper associated with the 2015 South Africa survey will enter the publication process in 2016. The international dimension of the risk project examines the political and economic foundations of sovereign risk premiums in global capital markets. The first paper in this effort (International Studies Quarterly 2015, with Raphael Cunha and Layna Mosley) demonstrates that sovereign risk pricing is less “sovereign” – or country specific – than previous research assumes. Drawing upon the notion that international market actors use heuristics such as country risk, regional, or developmental categories to assess sovereign risk, we argued that the price of sovereign debt in one country may be systematically tied to that of other countries with which it is categorized. We expect this to be true not only in bad times such as contagion from a crisis, but also in the long term we should see country risk assessments covarying by category. Indeed, our error correction models of monthly sovereign risk premiums reveal significant interdependencies in sovereign risk assessments among countries, net of global and domestic predictors. We conclude that professional investors’ reliance on country categorizations facilitates the transmission of market sentiments—which include lower as well as higher risk premiums—across groups of countries, even when countries differ in key measures of objective creditworthiness. Our analyses highlight the importance of bounded rationality and decision-making shortcuts in investors’ determination of sovereign risk pricing. The second paper in this project, also with Raphael Cunha and Layna Mosley, examines the conditions under which investors rely on partisan and macroeconomic signals to resolve uncertainty over investment risks in developing nations. Our argument suggests that partisanship and macroeconomic performance have conditional, rather than absolute, effects on sovereign risk premiums in emerging market debt. We find that these effects are mediated by time in office, wherein partisan shortcuts have a significantly different impact on sovereign risk perceptions for political newcomers, compared to longstanding officeholders.